Greetings on a fine summer's morning! I very much appreciated how quickly you responded to my letter about the Green Bandana Garden Club. Somehow, I knew you would know something about it. I should have responded back sooner to your letter, but it has been a busy week. On Monday, I bought a pile of old gardening books, including Pay Dirt by J. I. Rodale -- yes, the Rodale of Organic Gardening. They are all very interesting books but reading through them has certainly chewed up some time. Then the rest of the week flew by and I had to stop and celebrate Garden Bloggers' Bloom Day on Friday, the 15th. I'm so pleased and thankful for all who join in, but Hortense, where to find the time to comment on all of their posts? Anyway, this morning I found myself out in the garden, realizing I had failed to write back! I wrote an entire letter to you in my head -- I will try to remember what all I wanted to tell you. First -- oh my garden! I was afraid that if I didn't go out and weed in Ploppers' Field today, I would lose it all to the weeds and seedlings and have to start over. It was as close to a wild state as it has been in a while so I bravely waded in there and pulled weeds and deadheaded flowers to get it back into some sense of order. Had I not done that, it would soon be filled with thistle, dandelions, oxalis, and foxtail amidst the suckers of the locust tree. Yes, of course, I knew that the locust tree was a grove forming tree and would sucker, but I had no idea how much and how far from the original tree. Well, too late now. I just cut the suckers off as I find them throughout the garden. I absolutely refuse to give in to the foolish temptation that some gardeners have of letting a new tree grow wherever a good sprout of one shows up. Been there, done that, and you end up with a mess. I would also end up with loads of mulberry trees in the garden if I didn't weed, no doubt with trumpet vines climbing up through them. The trumpet vine is a new weed for me... it shows up near the big Viburnums where the little birds roost all day. They are delivery slaves of the weeds, those birds, dutifully "dropping" seeds for both trumpet vines and mulberries everywhere they can. It's a conspiracy! Speaking of conspiracies, what is going on with the Green Bandana Garden Club? You teased me with just a little info and then, well, I guess I can wait for more info. I have no choice, do I? You have the info and I want it, so I will have to wait for you to send me more details later. In the meantime, I'll keep weeding and cutting back in Ploppers' Field and discover plants I had forgotten about or could barely find amongst all the weeds and overgrowth. Just look what I found when I cut back the Amsonia. 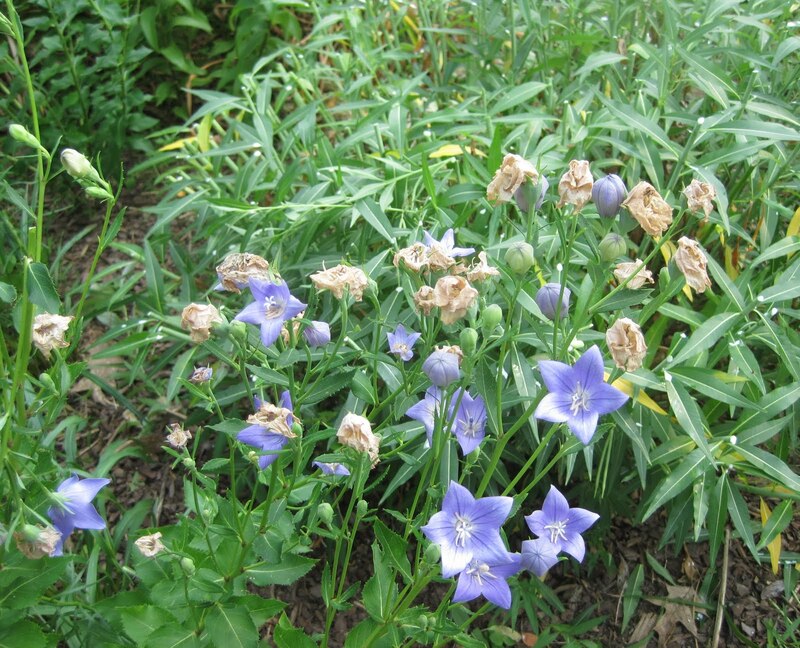 Yes, the balloon flowers -- Platycodon grandiflorus. And off to the other side of the Amsonia, I found some lilies getting ready to bloom. I'll send you a picture of those when they are actually blooming. Those lilies have it better than the ones hidden in here. Oh my, I've got some serious work to do to fix this end of Ploppers' Field. One good thing about it is that it is too thick and lush for thistle to grow in there, plus the garden fairies like it because it is a good place to hide and stay cool on a hot afternoon. And we have plenty of hot afternoons these days. But enough of my going on and on about my garden. Please write back soon, sooner than I wrote you and tell me what you know about the Green Bandana Garden Club. P.S. -- I am picking lots of zucchini squash and cucumbers these days. I must find someone to take some of it off my hands! I hope Hortense answers soon, can't wait to find out these secrets! The garden looks luscious, thick is good for keeping weeds at bay. And Garden Fairy habitat. Just found your blog and am already in love it! I do love your Ploppers Field. I feel that that is the way I garden mostly, and the garden develops a life of it's own. 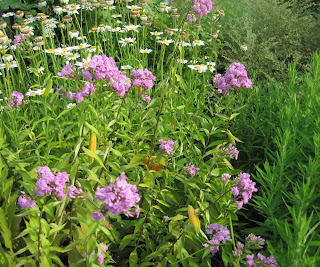 Your purple phlox (at least I think it's a phlox) would be a very nice color next to the assortment I have. Me too, me too, wanting to see Hortense's reply! This is better than a soap opera! Here is an idea for your excess produce. Ha, ha, I have a balloon flower hiding under an amsonia, too:) I also have lilies hidden by taller plants. But those are projects for some cooler days--right now about the only thing getting done in the garden is watering.